When I first got married, I had zero cooking ability. The only thing I knew how to make was hash-browns. And I didn’t even do that well. Once I started looking up recipes, I was amazed by how many things I was capable of making with the little bit of cooking knowledge that I already had. Tapestry crochet was the same way for me. The first time I made a tapestry crochet project, I didn’t even know it was technically tapestry crochet. But once started getting into it, I was thrilled to learn that it’s really not as complicated as it looks. I’m excited about this next pattern because it looks like something you could only buy in a store but the truth is that anyone who knows how to do a modified single crochet can do it. 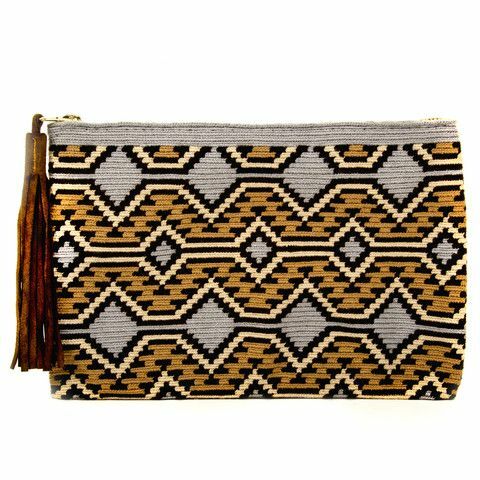 I found this beautiful clutch on Pinterest…. And in less than an hour I had the pattern graphed out. Here it is! I can’t wait to use this pattern! As soon as I make something with this pattern, I’ll post it here. I hope you make something with it too, and then share it with me and your fellow crocheters on the All Tapestry Crochet Facebook page. Happy Crocheting! Gorgeous pattern! Do you have to do the MSC for every pattern that has a diamond shape? And I will look into your other links and tutorials, but so far I cannot tell, where you are using your MSC.